It started as a chilly, blustery, rainy day. The Easter egg hunt at the American Consulate had to be cancelled. However, by the afternoon the rains gave way to sun, and the Consul General, Dave Arnett, ’65 and his wife, Vivi, were hosting a significant gathering of Wabash alumni at their private residence overlooking the Bosphorus. The gathering included six alumni, three from the class of 1965, and three more recent Turkish graduates. 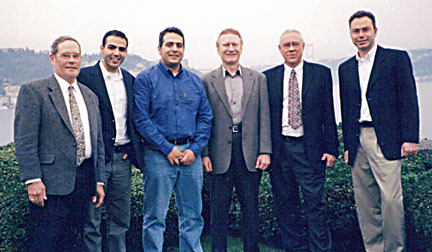 The picture, from left to right, include: Larry Blount, ’65; Donem Tokgoz, ’03; Gokhan Erkiralp, ’95; Dave Arnett, ’65; Eric Farber, ’65; and Selcuk Pultar, ’98. Eric and Kay Farber have been teaching English in Istanbul since August 2004. Larry and Susan Blount were visiting the Farbers, in an extension of a 3-week tour of Turkey. Dave Arnett is completing his third and final tour with the Foreign Service in Turkey, and retires to Sedona, AZ at the end of July. And the three Turkish Wabash graduates are pursuing promising careers in their native land. The Arnetts were most gracious hosts, entertaining us with cocktails, Turkish hors d’oeuvres, and stimulating conversation. If you haven’t already visited Istanbul and other parts of Turkey, you owe yourself a great adventure. We found the Turkish people engaging and warm. The country has a wealth of historical and cultural sites dating back to the very beginnings of civilization. It literally lies at the crossroads between Europe and Asia. Turkey is secular, democratic, and Moslem. And it has much to offer to both Western and Moslem societies about the potential for living with one another in a less confrontational world. And as the newest and largest candidate seeking to join the European Union, we found the political environment fascinating. Go, you will not be disappointed.